Crafting with t-shirts is so much fun, and making pretty dresses for your little girl is a quick and easy way to start t-shirt crafting. Check out these cute outfits from Sew Pretty T-Shirt Dresses: More Than 25 Easy, Pattern-Free Designs for Little Girls. 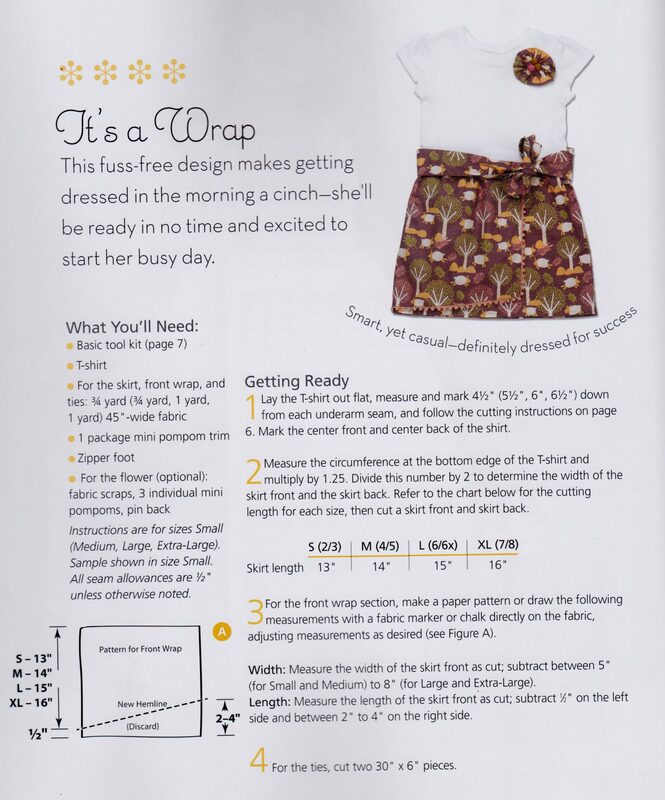 Today, we’re happy to share the instructions for one of the projects in the book — the “It’s a Wrap” Dress. Sewing tools such as scissors, etc. (Click image to enlarge instructions). 1. Lay the t-shirt out flat, measure and mark 4.5″ down from each underarm seam, and cut. Mark the center front and center back of the shirt. 2. Measure the circumference at the bottom edge of the t-shirt and multiply by 1.25. Divide this number by 2 to determine the width of the skirt front and the skirt back. For a size 2/3, the skirt length will be 13″. See image for pattern diagram. 3. For the front wrap section, make a paper pattern or draw the following measurements with a fabric marker or chalk directly on the fabric, adjusting measurements as desired (see figure A on image above). Width: Measure the width of the skirt front as cut; subtract 5″. Length: Measure the length of the skirt front as cut; subtract 1/2″ on the left side and 2″ on the right side. 4. For the ties, cut two 30″ x 6″ pieces. 5. Press the shorter side and the bottom edge of the front wrap piece 1/2″ to the wrong side. Using the zipper foot, sew the pompom trim to the wrong side of the folded edge, pivoting the stitching at the corner. 6. 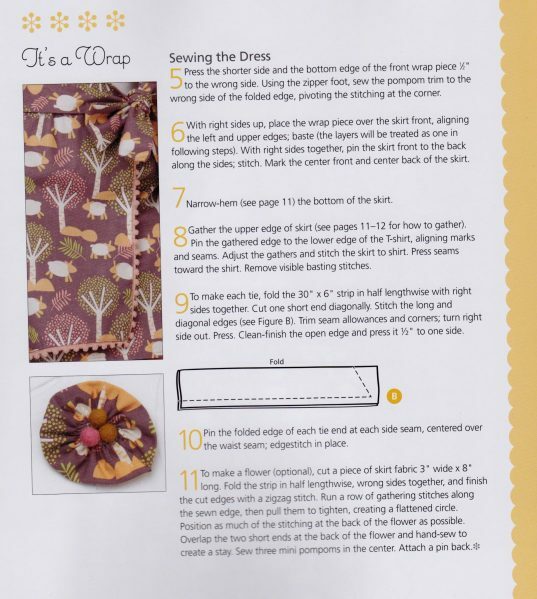 With right sides up, place the wrap piece over the skirt front, aligning the left and upper edges; baste (the layers will be treated as one in following steps). With right sides together, pin the skirt front to the back along the sides; stitch. Mark the center front and center back of the skirt. 7. Narrow-hem the bottom of the skirt. 8. Gather the upper edge of skirt. Pin the gathered edge to the lower edge of the t-shirt, aligning marks and seams. Adjust the gathers and stitch the skirt to shirt. Press seams toward the shirt. Remove visible basting stitches. 9. To make each tie, fold the 30″ x 6″ strip in half lengthwise with right sides together. Cut one short end diagonally. Stitch the long and diagonal edges (see figure B in the instruction image above). Trim seam allowances and corners; turn right side out. Clean-finish the open edge and press it 1/2″ to one side. 10. Pin the folded edge of each tie end at each side seam, centered over the waist seam. Edgestitch in place. 11. To make a flower (optional), cut a piece of skirt fabric 3″ wide x 8″ long. Fold the strip in half lengthwise, wrong sides together, and finish the cut edges with a zigzag stitch. Run a row of gathering stitches along the sewn edge, then pull to tighten, creating a flattened circle. Position as much of the stitching at the back of the flower as possible. Overlap the two short ends at the back of the flower and hand-sew to create a stay. Sew three mini pompoms in the center. Attach a pin back. Photos and Project from Sew Pretty T-Shirt Dresses by Sweet Seams Studio, published by Sixth&Spring Books. Photography by Dan Howell and dress design and instructions copyright © 2013 by Sixth&Spring Books/Soho Publishing, LLC. All rights reserved. Used by permission. i’m confused..I’d love to buy this book, but how? The link to amazon didn’t show Amazon selling it! Ha ha- I ‘invented’ these dresses in the early 80s for my daughters lol! Been making them for myself, an adult, for years as house dresses, bathing suit cover-ups, sleep wear, etc. You got my curiosity up… Just ordered the book from Amazon.com to see if there are any possible variations from what I have been making up, especially for making them up for my granddaughter.